for the Lil Divas friends for Valentine's Day. Step 1 - Enlist lots of help to peel those crayons! we had lots of crayons to make. 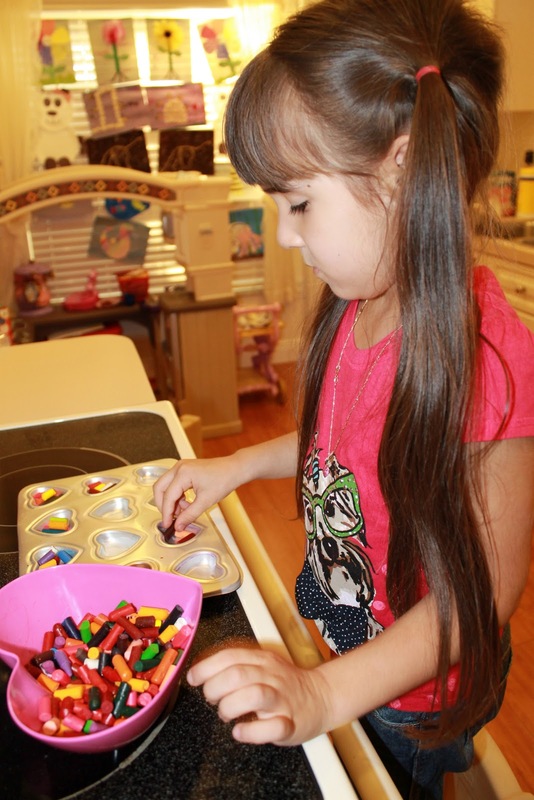 Step 3: Place assorted colors of crayons bits into your baking tin. You can use whatever you have handy. I keep this heart tin specifically for making our crayons. it really helps pop them out in the end! You need only about 8 -10 mins - just until they get melty. as you take them out of the oven. Tip: Let the crayon molds start to set for a few mins (just so they don't spill) then put the tray of melted crayon in the freezer for a few minutes. 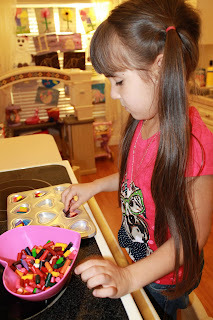 It's so much easier to pop them right out the tray & they are ready in mere minutes! "You're friendship colors my world. 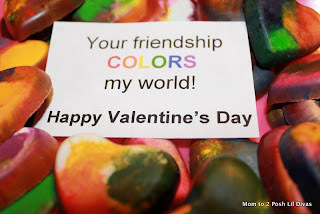 to their classmates/friends as Valentines this year. organized by Jaime at hands on : as we grow. I love the saying you have to go with them. Nice job! Very Cute, it looks like your girls had fun! Useful hint I learned the hard way: If you spray the pan with non-stick cooking spray first it's super easy to pop them out. I'm curious to know what set of instructions you used for your batch? My current "instructions" have come more as a result of my trial & error over the past year. 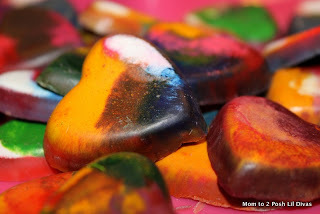 My initial attempt last year during our rainbow theme - http://momto2poshlildivas.blogspot.com/2011/03/rainbow-theme-making-rainbow-crayons.html was inspired by this post & I went w/those directions - http://www.teaching-tiny-tots.com/toddler-activities-rainbow-crayons.html. I found that it doesn't take 10 mins & I prefer to give them less oven time. I like less color mixing and more of the rainbow colored effect. What a great idea! We have a huge collection of crayons. These turned out very pretty! I've never seen a heart shaped tin. I'll have to look for one. I found heart shaped ice cube trays in the Target dollar aisle today 2 for $2.50. These are not silicone and will melt. I tried with these once and failed :(. Those turned out great! I love the rainbow effect too. We do this with a lot of different holidays. Love them! These really are pretty! What a great gift they would make! Thank you for sharing them at Sharing Saturday!! We look forward to seeing what you will share next week. Have a great week! What types of molds had anyone used with success? Metal or Silicone? I want to try this with my students. Thanks!